NB: RootsIreland, Ancestry and Find My Past are free to search, but require subscriptions to view records. 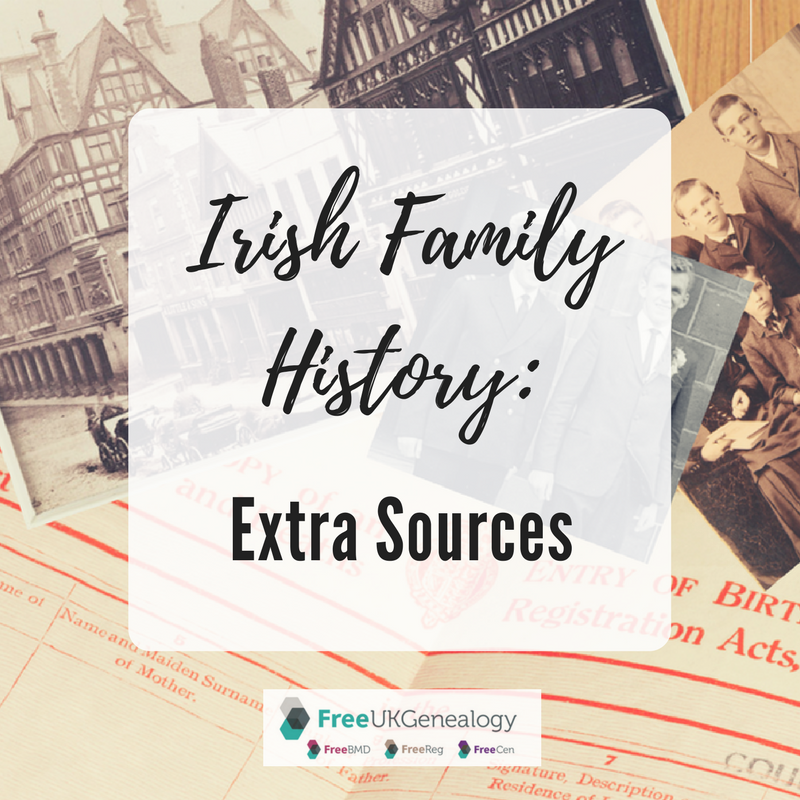 Once the records of civil registration, parish registers, census returns and land records have been fully explored for evidence of your ancestors, there are plenty of other sources that can supplement what has been established about your Irish family history. Some of these sources will add colour and depth to your family story and others may contain clues that will progress your research to earlier generations. A miscellany of records follows, that might be worth exploring for evidence of your ancestors in Ireland. In the last post we looked at land records that are used as census substitutes, the primary of these being Griffith’s Valuation. The Valuation Office Books are the precursor to Griffith’s Valuation. Compiled in the decades prior to Griffith’s Valuation the books are specific surveys of property organised into House Books, Field Books, Tenure Books and Quarto Books. The House and Tenure Books are probably the most useful for genealogical research. The House Books are valuations of buildings. Although the surveyors were only required to value buildings over £5, in many instances they valued every building in a townland. The books record the occupier of the building, its description and dimensions and each building was assigned a quality number that indicated its age, repair and the materials used in its construction. It is sometimes possible to identify the occupier of a building a decade or more prior to Griffith’s Valuation along with a description of their property, including farm buildings, which might be identified as stables, piggeries or coach houses. Not all House Books survive and not all House Books record every building in a townland, but they are certainly worth exploring for earlier evidence of your ancestor’s family. The Tenure Books record details of the tenure of each occupier of property and record the amount of rent paid by the tenant, the terms of their tenure; whether they hold a lease or are tenants from year to year, as well as observations on the property and the occupier. The Tenure Books can indicate the date when the occupier entered into a lease for their property and in some cases, if the lease was for a number of lives, the names of the lives on a lease, which can often be children of the tenant. The Tenure Books do not survive for every townland or parish, but are certainly worth exploring for evidence of your ancestor’s family. The Field Books are the least informative because they fail to record the occupiers of land holdings. The Field Books record the lots of land in each townland with a description of each lot, however, these can be difficult to match with the lot numbers assigned in Griffith’s Valuation and without the name of the occupier are in many cases useless, unless the researcher wants a picture of the general quality of land in a particular townland. Some Field Books record the names of the occupiers of houses that were valued in the corresponding House Books for that townland. The Valuation Office Books have largely been digitised and published online. They are free to search on the National Archives of Ireland genealogy website: http://www.genealogy.nationalarchives.ie where you will find a link to Valuation Office Books. The search engine requires exact spelling, so it may be sensible to use wild cards or just search for books relating to a specific parish or townland and then check all of the surnames listed. There are detailed explanations of each source in this collection, as well as an explanation of the shorthand used for describing houses in the House Books. The same collection is also published online at www.findmypast.ie in the Land and Estates collection, which has a better search engine. I tend to use both sites to make sure I have picked up everything relevant. The range of occupational records available for research in Ireland is vast. Many occupational records can contain vital clues for family history research. If your ancestor was described on a census return or birth, marriage or death certificate as a policeman, constable or R.I.C. or even R.I.C. Pensioner, there should be a record of their police service. The service records for men serving in the Irish Constabulary date from 1816 to 1922. Irish constabulary service records record the name of the recruit, their age, and physical description, county of birth, religion, date of marriage and county of birth of wife, occupation prior to service, date of enlistment and the name of the person who recommended them. The service record also indicates when the recruit was promoted, reprimanded and retired, died or departed the service. Many Irish policemen emigrated and joined police forces overseas in places like Manchester, New Zealand and South Africa. If your ancestor was a policeman in one of these places, he may have also served in Ireland prior to emigration. Three important clues in a service record are county of birth, date and place of marriage and the name of the person who recommended the recruit. Constables did not serve in their county of birth, which means the place where they married and lived is not usually their place of birth. Marriages usually took place in the parish of the bride, if the county of birth of the bride is identified your search for their marriage can focus on that county. If the county of birth of the police recruit is not enough to locate their family, the name of the person who recommended them can be used to narrow your search. This person was usually a landlord, Justice of the Peace, Police Inspector or parish priest or minister. By identifying where this individual was located at the time of your ancestor’s enlistment, you can determine that your ancestor probably lived in the same area. The location of this individual can usually be established using land records or directories or even a newspaper search. The Royal Irish Constabulary (RIC) service records have been published online at www.findmypast.ie but it might be sensible to first use the index or list of men who served in the RIC which is published online at www.ancestry.co.uk. The index will identify the service number of the recruit. Searching the service records at Findmypast using a service number is much more practical. The Findmypast collection also includes pension records and directories. The Irish constabulary also turn up in the Petty Session Court records published at Findmypast, where they took cases against the local population. A search of these court records can place your police ancestor in a specific jurisdiction at a particular time. Service records for the British Army and Navy can also record the enlisted’s place of birth and occupation prior to enlistment. Bearing in mind that large number of Irish men that served in the British army in the 19th century, surviving service records document a large portion of the Irish population. Another example of valuable occupational records relate to education. Unfortunately, it can be difficult to find evidence of children attending school in 19th century Ireland, but teachers are much better documented. The National Archives of Ireland hold a list of all National School teachers in the country in 1905. The value of this list is that it records the schools where the teacher was taught. As most children attended a National School close to their home, identifying their local school can lead to locating their place of residence or birth. This list is available in the reading room of the National Archives of Ireland. The Department of Education files for 19th century Ireland are held in the National Archives of Ireland and include teacher salary books as well as registers relating to the administration of the school, which include inspectors’ comments on the quality of the teaching and the departure, transfer or appointment of teachers to a particular school. In an appendix to a British Parliamentary Commissioners Report on the state of Education in Ireland in 1826 is a list of teachers organised by county, barony, parish and then townland. This list includes hedge school teachers and private school teachers and a description of the school. British Parliamentary Papers can be accessed online at most libraries and archives and the appendix can be searched for a surname or townland or parish. These are just two examples of the type of occupational records available for research in Ireland. John Grenham, in his book Tracing Your Irish Ancestors and on his website: https://www.johngrenham.com/records/jobs_in.php#records presents a list of surviving records that document certain occupations. Some of these sources are published, some online but many are only available in archives and repositories in Ireland. In recent years Findmypast have published a large collection of surviving court, prison and workhouse registers for Ireland. The mainstay of this collection are the Petty Session Court records. The Petty Session Court was the lowest court in the country, hearing cases of petty crime. In many instances the crimes were nothing more than being drunk and disorderly, allowing livestock to wander or driving a cart without lights on a public road after dark. Frequently family disputes or feuds with neighbours appear in the Petty Session Court records. This means that these records can identify quite a large number of the population for the areas and time frames for which the records survive. The defendants were usually recorded with their townland address, making it easy to identify relevant ancestors. More serious crimes were heard in the Quarter Sessions or Assize Courts and the best place for finding evidence of cases in these courts are newspapers. Irish newspapers reported on the local quarter sessions, often with verbatim transcripts of the cases heard. Irish newspapers have been published online on two different websites. The British Newspaper Library holds a copy of every Irish newspaper published from 1826, as well as an extensive collection of pre 1826 Irish papers. This collection is being slowly digitised as part of the British Newspaper Library’s online collection and is replicated at www.findmypast.ie A separate collection of Irish newspapers can be found online at www.irishnewsarchive.com Both sites are subscription websites and although there is some duplication, their collections are largely different. The best means to search these vast collections for relevant reports on your family is to search using their townland address, an almost unique search term, which, when coupled with your family surname, should locate articles relevant to your family. While it can be fun undertaking broad newspaper searches for any reference to your family, if you wish to undertake a more targeted search for a specific event, such as a court appearance, birth, marriage or death notice it might be sensible to start your search by identifying the newspapers most relevant to where your ancestors came from. The National Library of Ireland website hosts a Newspaper Database (https://www.nli.ie/en/catalogues-and-databases-printed-newspapers.aspx). This is not a collection of digitised Irish newspapers, it is a listing of all surviving newspapers for Ireland. It is possible to search the list by town or county of publication. Your ancestor is much more likely to appear in a newspaper published in the area in which they lived. By identifying relevant newspapers and then determining whether the paper has been digitised and published online you can target your search to a specific publication. If the newspaper has not been published online it may be necessary to undertake a manual search at the British Library, the National Library of Ireland or at a local library or archive. If your ancestors were transported to Australia they should appear in the Transportation Register, a collection created from Irish and Australian records and published on the website of the National Archives of Ireland (http://findingaids.nationalarchives.ie/index.php?category=18⊂category=147) The database, which can be searched by name, should indicate the date and place of the trial and date of transportation. The trial may have been reported in local newspapers which may contain more details of the crime or the origins of the convict. The Transportation Register will also include references to additional files found in the National Archives, such as the CRF, (Convict Reference File). The CRF, if one exists, can contain letters from the family of the convict pleading for clemency. Surviving Prison Registers held in the National Archives of Ireland have been digitised and published online at www.findmypast.ie. Although these are far from complete and do not cover the entire country, if a relevant entry is found it can be illuminating. Prison registers often recorded the age, description, religion and birth place of the convict, which can lead to birth or baptismal records and other family information. The Admission and Discharge Registers for the two Dublin City workhouses have also been published on www.findmypast.ie. For families from Dublin city it is certainly worth exploring this collection. The poverty that the majority of the inhabitants of the city lived in often led to brief spells in the workhouse. Women used the workhouse for maternity service and the elderly and sick also used the workhouse for medical care. Along with the Admission and Discharge Registers are the Minutes of the Board of Guardians for both Dublin Unions, North and South. The minute books can contain reports from inspectors on children who were boarded out (fostered). If you are trying to find ancestors who might have been orphaned or abandoned in Dublin this is an excellent source for information relating to their care. The importance of land records as a census substitute was illustrated in the last post. In addition to the countrywide land surveys of Griffith’s Valuation and the Tithe Applotment Books, it is sometimes possible to locate records relating to the estate on which your ancestors lived. If your ancestor was a tenant of a large well administered landed estate in Ireland there may be surviving rent rolls, lease books and other records that document the tenantry. Rent rolls and lease books can sometimes document tenants paying rent back into the late 18th century. Leases, if found, can sometimes name the children of the leaseholder as lives on the lease. Tenant application books can contain requests from tenants for money to emigrate or to make improvements to their holding or even for intervention in a dispute between neighbours. Employment records can detail the labourers, carpenters, masons, surveyors and many others employed on an estate, how much they were paid and the hours that they worked. The first step to locating estate records is to identify the owner of the estate, bearing in mind that a great deal of land in Ireland changed hands in the 1850s and 1860s. The landlord is recorded as the immediate lessor in Griffith’s Valuation. Once the owner of the estate has been identified a search can be carried out for surviving estate records. The Landed Estate Database at www.landedestates.ie can be searched for the estate owner and should list surviving records relating to the estate and the location of the records. However, this is not a comprehensive database. Estate records identified as part of the cataloguing of Irish manuscripts in repositories in Ireland and around the world during the 20th century have been listed at the National Library of Ireland website: www.sources.nli.ie where you can search for a reference to the estate owner. This site lists collections in numerous repositories including the National Library of Ireland, the National Archives of Ireland (Public Record Office) and the Public Record Office of Northern Ireland, as well as some British and French repositories. The Main Catalogue of the National Library of Ireland has also integrated their own manuscript collections, so should also be checked for estate records or collection lists relating to Irish landed estates. John Grenham’s website www.johngrenham.com also lists estate records by parish, although this is not a comprehensive record. The records themselves are not going to be available online and will require a visit to the repository where they are held or commissioning a researcher to inspect these records on your behalf. The sources listed above are only a taste of what is available. At www.johngrenham.com you will find many additional sources listed for each parish in Ireland. If you identify a manuscript source that has not been published online you can use the Timeline Genealogy Clerk service to request a copy or a search of a document found in an Irish repository (http://timeline.ie/irish-genea...) or commission a professional genealogist in Dublin or Belfast to access the material on your behalf. Genealogical research should always be systematic, working methodically back from one generation to the previous. Gather as much documentation for each ancestor as you can find, as each source may contain a valuable clue that will assist further research. Always save every document you find; label it and make a note of the source. This will save you coming back years later to try and find a document that you once saw but cannot remember where. Keep your research organised, you never know what future generations will be relying on your work when their interest in family history is suddenly piqued.